It’s a Bird, It’s A Plane… It’s Anthony Bourdain! Last October, celebrity food critic and travel expert Anthony Bourdain announced his plans to debut a new web series titled "Anthony Bourdain's Alternate Universe," in which his animated alter ego served up a fresh, satirical view of the culinary community. Now, one year later, Bourdain has decided to keep pouring his creative juices into the world of animation -- this time in comic book form. The famed author of "Kitchen Confidential" and host of "No Reservations" has just announced that he will be partnering with Vertigo (an offshoot of DC Comics) to create a new graphic novel. 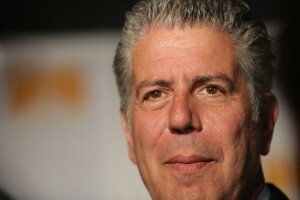 Given that DC Comics is the home for such household names as Superman, Batman, and Wonder Woman, some Bourdain aficionados surmise that the project may turn out to be more successful than his previous series, which was only made into 6 episodes. Additionally, Bourdain will share creative content with former Superman editor Joel Rose and sci-fi illustrator Langdon Foss. The series is tentatively titled "Get Jiro!" and its main character is described as "a mysterious, top-notch sushi chef" who plans to right the wrongs of the culinary world one hack-n-slash adventure at a time. Vertigo says readers can expect "a futuristic action thriller that takes America's newfound obsession with exotic cuisine to a manic, violent extreme." For now, this small taste is all that Bourdain's fans are going to get. The first issue is scheduled for release during the spring of 2012.